This section includes the years from 1954 until 1958. Cash eventually managed to please Phillips with some songs from his earlier years in the Air Force. And he recorded “Hey Porter” and “Cry, Cry, Cry” in 1955. When he signed the contract with Sun in ’55 he would take “Johnny” as a stage name. The first single “Hey Porter” made reasonable success at the hit parade, and “Cry, Cry, Cry” made US Country Chart in 1955 at #14. After the first success Cash started with a hit production like few. In 1956 he released the singles wich he really experienced success with. Like cars on an assembly line, “Folsom Prison Blues”, ”So Doggone Lonesome”, “I Walk The Line”, ”Get Rhytm”, “There You Go” and “Train of Love”, rolled out of the Sun Recording studio. “Folsom Prison Blues” and “So Doggone Lonesome” made #4 on the US Country charts. And Johnny Cash made his first #1 position with the “I Walk the Line”, “Get Rhytm” single. “I Walk the Line” also made it to the US Singles list as #17. 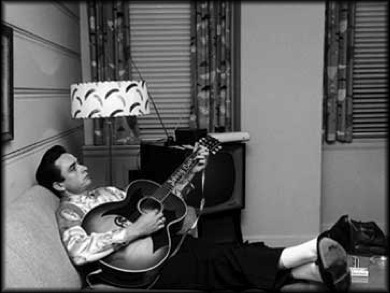 Cash released 10 more songs divided on five singles on Sun Records before he moved on to a bigger label. And Sun Records continued to release singles of him well into the ‘60s. In 1957 Johnny Cash was the first artist to release a long-playing album on Sun Records. The LP was called “Johnny Cash With His Hot and Blue Guitar”. This was one of 18 LPs released from Sun. Only two of them where released before Johnny Cash left Sun. Johnny Cash toured with the rest of the Sun artists. This constant touring and later drug abuse would put an intense strain on his marriage. In this period Cash became father of the soon-to-be artist Rosanne (1955), and Kathleen (1956). Although Cash were the most consistently best-selling artist of Sun, and one of the most profilic artist of the time, Cash would soon start looking for bigger labels. Sun just wasn’t big enough for Johnny. He felt constrained by his contract with them, and wanted to experience more than what Sun could offer. Elvis Presley had already left Sun, and Cash would do the same in 1958. He went to Columbia Records and signed a highly lucrative contract.